These were the base numbers with the bike straight from the dealership, completely stock 1 mile on the bike. Cecil went ahead and tweeked it and was able to squeeze couple more hourses out of it. 1) The baseline numbers with the stock bike the temps were 20 degrees colder and alot less humidity, it was already raining outside and he keeps the doors to the warehouse open. 2) The bike is stretched about 8+ along with the the chain was switched out for a 530ZZZ and tightened up a bit, im not sure how much of a loss that would be on a dyno. 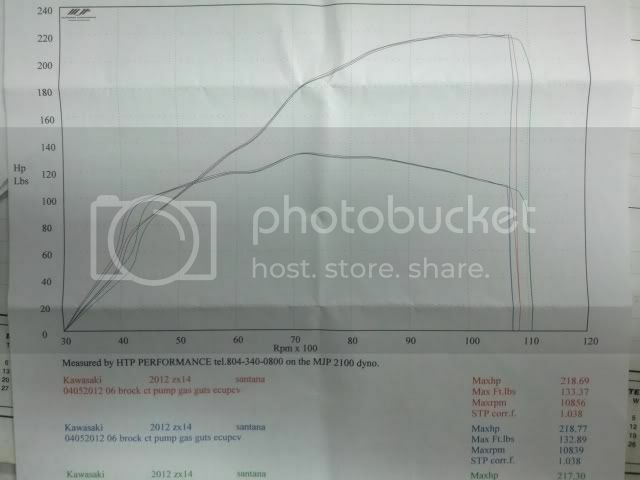 3) On his dyno which has an actual "weather station" from what he was telling me, that .012 difference in the correction factor is about 8HP loss. post up the chart. Inquiring minds want to know. 9hp and 1lb ft torque? seems like alot of cash to put out for lil gain. or am i missing something? Yea thats what i was thinking but im not sure how much of a difference those hindering factors play, the warmer weather, extra humidity, difference in correction factor, extended arm etc. He did tell me that with his new software he is able to play around with the correction factor and have close to the same numbers regardless of the weather but he has yet to mess with that part of the program. Sounds good .. The extra chain will cost you hp ..But those are still great numbers .. Brock said never to dyno this bike with more than 30 psi or it will be down on HP because of tire slippage ..So 35 psi may have cost you some HP also..Gadson and Roaring toys both found this out on the dyno also ..
yea im satisfied with where its at, and with the fact he was able to get a couple of more horses out of her. One thing i did notice was as soon as he was bout red line and let off the throttle the KTRA and ENG lights came on, he would then just turn the key off then back on and they were gone until he did the same thing again. Dont know if this is caused by the reflashed ECU, the PCV or cause the bikes temps, but they would reset once the key was turned off then back on. They all toss that light .. don't worry about it ..Remember even with the TC turned off it still knows the front wheel is not turning ..I goes a bit deeper than that but i can get into that just yet .. Here is today chart after all was said and done. I've heard of SAE and STD, but what is STP? Is that a greater correction factor than STD? 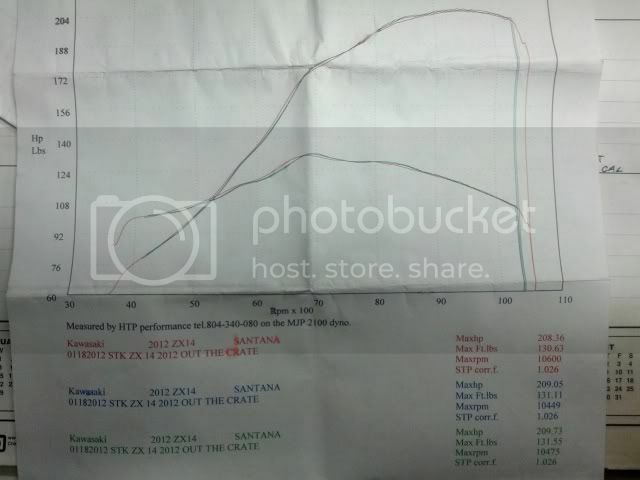 Damn look at that TQ jump from stock to modded .. HP Jumps up better also and holds on much longer .. Big peak HP numbers are always pretty to look at but the numbers below peak tell the real story ... ...That is one strong bike ..
Also, is the re-flashed ecu rpm only 10,856? i see what you mean by it holding on for a longer duration versus a peak. ECU was raised 500 over. it looks like max rpm difference is 256 from stock to reflashed. it looks like max rpm difference is 256 from stock to reflashed. 10,856? That's not what you should be looking at ... peak hp stock was right at 9500 ( look at the first chart ) ... Peak HP after mods was around 10850 .. If you look you will see the first chart HP dropping like a rock where the second chart is holding and not dropping .. I wish we could see the charts over lapped ..Then you would see the big picture .. I am with ya on the A/F... That's what's important to me. Everybike I have had tuned to 13 to 1, it made good dyno numbers, but at the track I had to richen up the A/F to get the MPH ups. Lee, have you made any changes to your Brock Map as yet? I know you tipically run your bikes on the richer side. Well just got my ct single and pc yesterday,its getting put on today,hopefully ill get more power,and mine should be better to tell because i only have a few hundred miles more on my bike and the temp.are basiclly the same outside and i didnt and a new chain or anything to the bike besides pipe and pc. hopefully ill take it to the dyno saturday. No changes yet .. Hell i just got the PC last night ..lol.. Brock has found that this new zx14r likes to be much leaner than the old zx14 ..13.5+ zone makes better power on the new bike .. Brock is at the track as i type this .. I'm sure he will be making map changes as the day goes by .. We will all know what it wants on the track very soon .. I will run my Map as is and get some base line runs and make some small changes and see what it wants and likes at speed ..
well you know what they say lean is mean, well thats what ive always heard in the car world. I saw the highest number on my grand national running low 13 a/f, but that was before i knew thats a no no for a FI car and the injectors were too small for my set up.